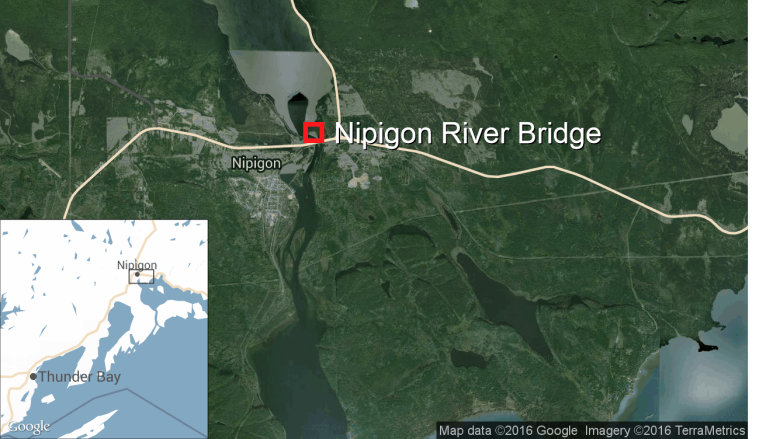 ​Two provincial officials are in northern Ontario today to tour the Nipigon River Bridge, which failed on Sunday and severed the sole east-west route across the region for a day. One lane of the bridge was reopened to cars and lighter trucks on Monday, but there has been no estimate as to when the bridge — which is part of the Trans-Canada Highway — will be fully functional. Transportation Minister Steven Del Duca and Northern Development and Mines Minister Michael Gravelle are to visit the site today and talk to the media. About 1,300 trucks cross the bridge in Nipigon, Ont., every day, and the Ontario Ministry of Transportation's 2012 commercial vehicle survey says truckers depend on the bridge to move $100 million worth of goods across Canada daily. Nipigon Mayor Richard Harvey describes the bridge as "probably one of the most important transportation infrastructure points in the country." Cars and most trucks are crossing the bridge about 10 to 15 minutes slower than usual, and officials decide on a "case-by-case basis" whether to allow trucks weighing more than 63,500 kilograms over the bridge. Truckers lack alternate routes in the area when the bridge is out of service. They could opt to travel through the United States, but that's become more difficult post 9-11, when the U.S. beefed up security measures at the border.